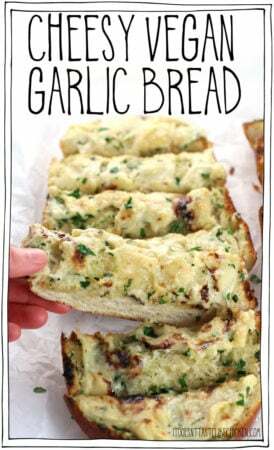 This dairy-free garlic bread is quick and easy to make. Smothered in a homemade vegan cheese, perfect paired with your favourite Italian pasta dish. There's also an option for classic garlic bread (without cheese). In a small bowl, mix together the vegan butter, garlic, parsley, and salt. Spread the butter evenly over the surface of each loaf half. For classic garlic bread without the cheese, skip to the baking step. For cheesy vegan garlic bread, divide the Melty Stretchy Goeey Vegan Mozzarella evenly among the two loaf halves and spread the cheese. It's ok if it isn't perfect, it will be easier to spread once baked a little. Bake uncovered for 10 minutes. If needed you can use a knife or spoon to spread the cheese a little more after baking. You can optionally brown the cheese by turning your oven to broil, and placing it under the broiler for 1 - 2 minutes. Keep a close eye on it so it doesn't burn. There is no need to broil the classic cheeseless version. Slice into strips and serve alongside your favourite pasta, or soup, or chili. To foil or not to foil? I prefer baking my garlic bread without foil which results in a crispy crust on the outside and fluffy bread on the inside. If you prefer bread that soft all the way through then you can cover the pan in foil before baking, making sure to leave a bit of space so the foil doesn't stick to the cheese.